Located between palm trees and Baie Rouge Beach, Belle Fontaine sits waiting with 5 bedrooms and an open floor plan ready for your vacation entertainment. You’ll love the outdoor living space with a large deck, a cocktail table that sits directly in the pool, and a gazebo! 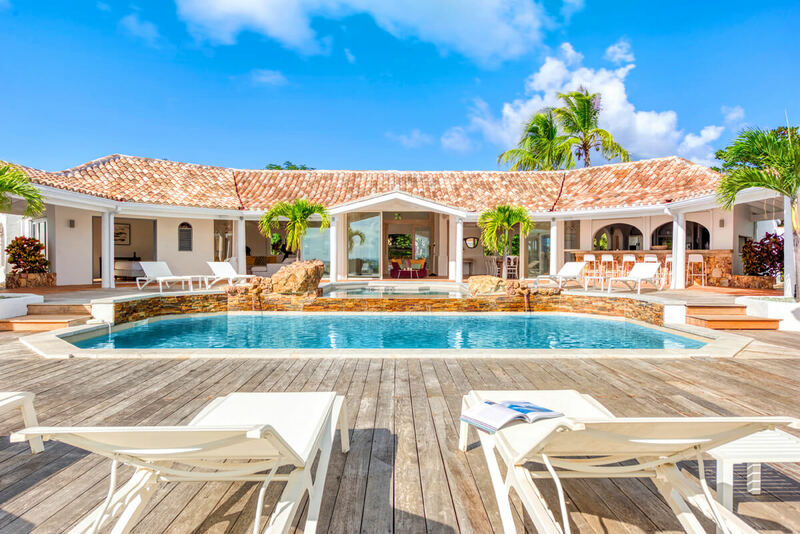 Lounge poolside, enjoy the water and ocean breezes as you soak up the sun, and make the most of heaven in the Caribbean. Equal bedrooms, great for couples! Belle Fontaine Villa sits secluded amongst the Terres Basses hillside, with ocean views that stretch to the horizon. This multilevel villa is surrounded with tropical gardens that create privacy despite the villa’s convenient location. The huge wooden deck and double pool take up the upper level, while the lower level holds two bedrooms and a ping pong table. The smaller pool is inset with a table that’s the perfect size for enjoying an afternoon cocktail. The larger pool is more suitable for swimming. Alongside the pool, a large gazebo shades al fresco lounging, cooking, and dining space. Inside, the impressive living room features a TV, ceiling fan, and ample seating. The expansive, well equipped kitchen has a large cooking island and a pass through window that doubles as a breakfast bar. Each of the bedrooms have king-sized beds, ensuite baths, air-conditioning, and ceiling fans. Three have sea views, and two have garden views. Large walk-in showers overlook the sea or garden, and one has a private outdoor patio. This villa is secluded, yet close to the beach. It’s two minutes to dining in Baie Nettle, and seven minutes to Marigot’s restaurants, Creole Market, galleries, and shopping. A 10-minute drive will take guests to the airport, and a 30-minute drive will take guest to Grand Case and Phillipsburg. pool size 42 ft. x 20 ft.
Three minutes drive to Baie Rouge Beach.